The question is not frivolous or trivial: was Paul an Apostle of Jesus Christ or a fraud? We’ve seen from the history of the early Church in Luke’s second letter to Theophilus (known to us as the Book of Acts) that Jesus Christ personally called Paul to be an apostle (Acts 9) and that the Holy Spirit called Paul to open the door of faith to the Gentiles (Acts 13). About half of the Book of Acts references Paul’s ministry to Jews and Gentiles, and Paul wrote almost half of the New Testament. However, even with that overwhelming evidence, many people still refuse to believe that Paul was an apostle and go as far as to call him a fraud. In calling Paul a fraud they also call his writings fraudulent, which is a major issue for Christians. Most of the Paul-challengers I’ve heard from also believe 2 Peter is fraudulent, partially because the letter supports Paul’s apostleship and his authorship of Scripture. If Paul is fraudulent, then what do we make of the writings of one of Paul’s most famous students, Luke? Can Luke be trusted if his mentor is a fraud? I hope you grasp the seriousness of this question. Much of Christian theology (“God knowledge”) is based on the prophetic and teaching ministry of Paul. If Paul was a fraud and his teachings are fraudulent, then Christianity as we know it is wrong and should be corrected. That’s what many people are challenging us to do – throw out Paul and correct our knowledge and practice to align ourselves with only a small number of New Testament Books. That’s where some Paul-challengers differ. Some think Luke and Acts are okay, even though Luke was a student and fellow minister with Paul. Some do not think Luke or Acts are okay. Some think Luke is okay, but only the first six chapters of Acts are true. Some think Matthew is okay, but Mark, Luke and John are not. Some think 1 Peter is good, but 2 Peter isn’t. Some think John’s Gospel and 1st John are okay, but that 2 and 3 John and Revelation are not. Do you see the problem here? If this is your first time reading this series, please read through the first 12 parts before continuing here. We established the foundation of Paul’s ministry in the first ten parts, then started answering specific questions by Paul-challengers in parts 11 and 12. I’m answering every question sent to me about Paul during the past several months and posting them exactly as sent to me. If Paul’s claim in Galatians 2:16 is true, that we are saved by faith only, then why does James refute this in James 2:14-26 calling the author of this doctrine “o vain man” in v.20? This is the most asked question I receive about Paul’s apostleship. How could Paul be an apostle if James taught something different? First question that comes to mind is about James. 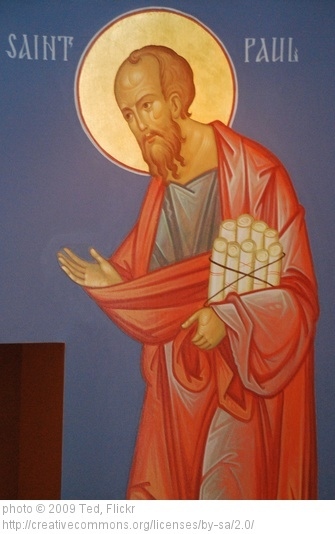 This is not James the Apostle. King Herod killed him prior to the Jerusalem Council (Acts 12). The James who wrote the Book of James is believed to be the half brother of Jesus. This James was also a leader in the Jerusalem assembly. He is not called nor does he refer to himself as an apostle in Acts or the Book of James, but Paul does refer to James as an apostle. In fact, it’s obvious from Paul’s writings and the Book of Acts that Paul had great respect for James. It also appears from Acts that James respected Paul and the special call Jesus and the Holy Spirit had for Paul. Many scholars estimate that Paul wrote Galatians early in his ministry (approx. 50 AD), so Peter, James and John would have had plenty of time before their deaths to refute Paul’s claim concerning what happened in Jerusalem and Antioch. James may have written his letter before the Jerusalem Council, but Peter and John wrote years later and could have addressed Paul’s statements if false. If James wrote his letter prior to the Jerusalem Council, that would explain why he did not address the issue of Grace to Jews as Paul did later to Gentiles. James wrote specifically to Jews – “to the twelve tribes which are scattered abroad” (James 1:1). James’ letter is entirely Jewish. Nothing is addressed about any Gentiles members in the local assemblies. Given the surprise and concern expressed by the apostles (except for Peter) and the elders in Jerusalem (Acts 15), James writing his letter prior to that would explain why. Paul is often accused of having no place for “works” in his Gospel. That’s not true. Salvation is by grace through faith. It is not something we deserve or can earn. We cannot boast about “working” for our salvation. Our boasting is in Christ. Paul’s letters are abundantly clear that God provides “justification” through faith, not works – “knowing that a man is not justified by the works of the law but by faith in Jesus Christ, even we have believed in Christ Jesus, that we might be justified by faith in Christ and not by the works of the law; for by the works of the law no flesh shall be justified” (Galatians 2:16). However, we are God’s workmanship, created in Christ Jesus “for” (Greek – with a view to) good works, which God prepared “beforehand” that we should walk (order our behavior) in the sphere of them. “Works” is absolutely part of Paul’s Gospel, so much so that he warned the Corinthians that God would test each one’s work, of what sort it was. Join us again next time as we continue to investigate whether Paul was an apostle or a fraud. I can also mention on the other side that James did not say that your works can save you… he said that faith without works is dead and if your faith do not produce works you do not have real faith. Then the problem is still with your “faith”; simply adding works is not the answer, but “faith that works through love”. This post is very important to the life and growth of the church. I have been dealing with friends on Sodahead.com that have been deceived by groups of Jewish Christians who LITERALY HATE the Apostle Paul and all he wrote, so it’s very important for every believer to immerse themselves in the New Testament to protect themselves from the deception of those who are uninformed or misinformed!